Like everyone in Dublin’s music “scene”, I like to play the “I knew Villagers before you game”. It’s not quite up there with the classic “I heard Orcade Fire before you” eyebrowy skit, but when you first became aware of Conor O’Brien’s solo project is still used as a bit of a barometer of, eh, taste and awareness. Anyway I wasn’t at the first Villagers gig but was at a fairly early one when he played the Ruby Sessions upstairs in Doyles. A quick search through gchats reveals it was on February 3rd 2009. So I guess that’s maybe within his first dozen gigs. Since then I was lucky enough to catch shows in Crawdaddy, Whelans, Electric Picnic and The Button Factory. I’m fairly sure there may be more but can’t think of them right now. Conor’s ubiquity over the last 2 years since that infamous live debut in Whelans with Halves has been a delight and anyone who has seen the show or heard the EP (I think mine is #302 of the original run, go me) or the album seems to have fallen for the guy. So, on to Monday’s show. It was a solo performance and while Cormac (keys) and Tommy (guitar) are two of my favourite Irish musicians to watch, it’s always a bit of a novelty to see the songs stripped back like this. Plus it gives Tommy more time to work on a new Berkeley album (come on man, make it happen!). Playing support to the small crowd (I’m estimating 60 paying customers?) were North Carolina’s Lost in the Trees. Their unusual brand of gospel folk was great at first but then the string section began to get a bit schmaltzy for my liking. All ridiculously talented people though, it’s pretty rare you see a girl able to handle a french horn and a big glock like that. They were an enjoyable opener but once they were finished up, I was delighted to to see the entire stage cleared for Conor’s guitar case, a DI box and a microphone. To put it simply, the next hour was lovely. The shyness and nerves which seemed to exist at the first few Villagers shows has now gone and Conor’s more than happy to make lame jokes about his converse in between the songs. It may be one of his oldest solo songs, but The Meaning of the Ritual really stood out alongside newcomer In a New Found Land, you are Free. While some of the tunes seem to have gotten shiny new arrangements (Pieces), most of them are being performed exactly the same as they were eighteen months ago. And whether this was your first time or your tenth time seeing the show, it’s unlikely anyone went home feeling like he hadn’t given his all to each of the dozen songs performed. One of the things that stood out in the wonderful video document of the Villagers gig last week in Dublin’s new Work Man’s Club was Conor’s response when asked by Today FM’s Paul McLoone whether he preferred performing solo or with his band. It pretty much went, “When I’m with one, I want the other.” While it may just have been a throwaway line, it kinda stuck with me. I love the fact that the dude never seems to be 100% at ease with what he’s got and always wants to push himself on to something new and challenging. 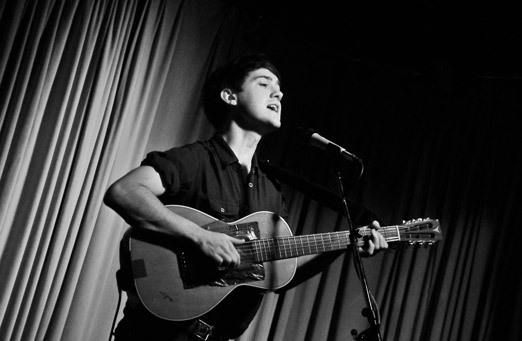 This entry was posted in Canada, featured, Ireland, Live Reviews, Music and tagged Conor O'Brien, Drake Underground, gigs, Live, Toronto, Villagers. Bookmark the permalink. Nice post, but I would’ve liked to hear how it went down with the Canadians too? He was telling me he has 70 shows between now and Christmas, that’s 70 shows in 90 days! Insane stuff…and that’s AFTER the 6 month buzz..
Nigel you old dog…still got it! Thing with a Villagers show is you can sometimes kind of forget about the other people there… But I think by the end of it he had them eating out of the palm of his hand. The Torontonians can be petty reserved and aren’t just gonna clap and whoop for the sake of it, so the room of 60 or 70 people made a lot of noise during the encore break and at the end of the show if they were indeed faking it.